Ramsay Hall is a 6-storey student residential block at the University College London (UCL) constructed with a concrete frame, concrete floor slabs and brickwork. There are brick slips at all floor levels. The two main elevations are in Whitfield Street and also facing the college internal courtyard. 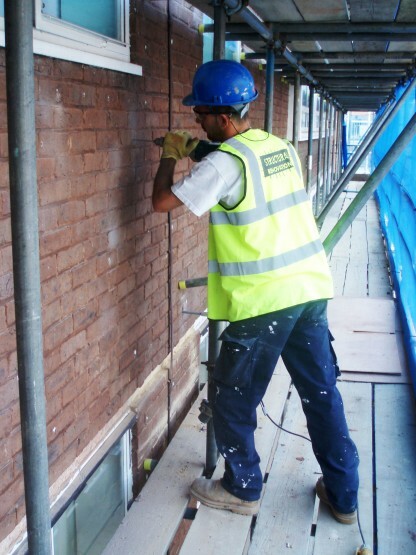 An inspection of the slab edges identified that the brick slips were inadequately bonded to the structural slab, which itself had failed in places due to corrosion of the reinforcement. In many instances the brick overhang above the slab edges was greater than current standards permit. We were invited to tender for the remedial works because of our experience in concrete repairs, colour matching mortars and masonry repair and were subsequently awarded the package as a subcontractor to DW Bevan Ltd.
All brick slips were removed from the slab edges to allow inspection of the concrete beneath and overhang of the brickwork above followed by instructions from the client’s structural engineer. Helifix Helibeams were installed above in areas of excessive brick overhang to strengthen the masonry and allow the slab edges to be repaired in a hit and miss sequence. Individual bricks above the slab edges were drilled and fixed to the structural concrete using the Helifix DryFix system. Similarly the outer skin of brickwork was retro fixed to the inner skin to all elevations. Slab edge repairs were carried out using a prebagged polymer-modified mortar. These were either finished recessed to accommodate a coloured mortar that simulated the brickwork or flush over windows to accept a white coating. Extensive trials were required to produce the mortar that would both match the existing brickwork in both colour and texture. 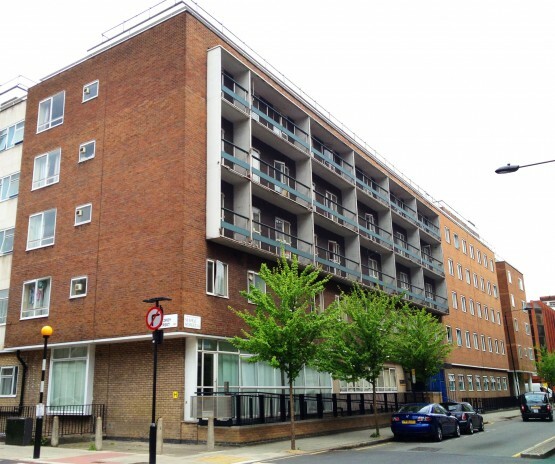 Other works carried out included concrete repairs to window surrounds and balconies and replacement sealant to expansion joints.